Environmental and Social Justice in the City. Cover. Massard-Guilbaud, Geneviève, and Richard Rodger, eds. Environmental and Social Justice in the City: Historical Perspectives. Cambridge: The White Horse Press, 2011. The world is full of environmental injustices and inequalities; yet few European historians have tackled these subjects head on, nor have they explored their relationships with social inequalities. 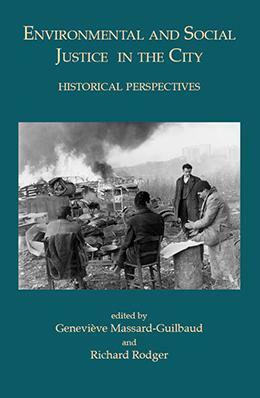 In this innovative collection of historical essays, the contributors consider a range of past environmental injustices, spanning seven northern and western European countries. Several chapters add a North American perspective. In addition to an introductory chapter that surveys approaches to this area of environmental history, individual chapters address inequalities in the city as regards water supply, air pollution, waste disposal, factory conditions, industrial effluents, fuel poverty, and the administrative and legal arrangements that discriminated against segments of society. Geneviève Massard-Guilbaud is professor at the École des Hautes Études en Sciences Sociales, Paris, where she holds a chair in environmental history. Her recent publications include Common Ground: Integrating the Social and Environmental in History, with Stephen Mosley (2011), and Histoire de la pollution industrielle, France 1789–1914 (2010). She has been the president of the European Society for Environmental History. In France, she initiated the RUCHE (Scholarly Network of Researchers in Environmental History). At the beginning of 2010 she was appointed by the Humanities and Social Sciences Institute and the Ecology and Environment Institute of the CNRS to lead their common interdisciplinary research network in environmental history. Richard Rodger is professor of economic and social history at Edinburgh University. He has published widely on the economic, business, and urban history of Britain since 1800, was editor of Urban History from 1987 to 2007, and joint editor of Ashgate’s Historical Urban Studies series. Rodger is the author of The Transformation of Edinburgh: Land, Property, and Trust in the Nineteenth Century. His ongoing research includes a project on the development of public and environmental health in Victorian Scotland.